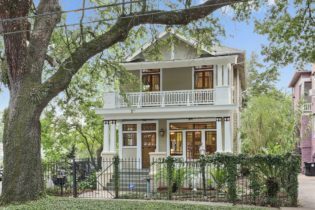 PRIME UPTOWN LOCATION, HISTORICAL HOME BUILT IN 1910, & DIRECTLY ON THE NEW ORLEANS STREETCAR LINE. FOR SHOWING APPOINTMENTS PLEASE CALL 504-444-2920. Live in first floor bedroom, use upstairs for guest occupancy. New Orleans has huge demand and potential! Lived in as single home, but easy to convert to Bed and Breakfast. Top location, convenient to the French Quarter and all New Orleans has to offer. Ideal location. This beautiful & bright home sits on a corner lot with plenty of sunshine & facing the oak lined street of Carrollton Ave. Charming interior & exterior details, original hardwood floors, moldings throughout, 6 fireplaces including French subway tile used in the metro of Paris, beautiful & abundant windows with tree & skyline views, lots of natural light. Remodeled kitchen w/granite, added 3rd bathroom. All bathrooms remodeled. Flowing floorplan, high ceilings, large bedrooms with plenty of closet space, huge Master suite with walk in closet and adjacent office or nursery.